Ukrainian orbital missile. The R-36-O was the only orbiting military nuclear weapon ever deployed, although in order to remain legal under international treaties it was a 'fractional orbital' weapon. Although American infrared early warning satellites invalidated the 'surprise attack' component of the concept, 18 missiles were operational from 1969 to 1983. AKA: 8K69;F-1r;FOBS;Fractional Orbital Bombing System;R-36-O;Scarp;SS-9 Mod.3. Status: Retired 1970. First Launch: 1965-12-16. 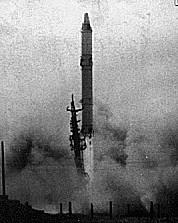 Last Launch: 1970-07-28. Number: 22 . Payload: 1,700 kg (3,700 lb). Thrust: 2,366.00 kN (531,897 lbf). Gross mass: 182,000 kg (401,000 lb). Height: 32.60 m (106.90 ft). Diameter: 3.00 m (9.80 ft). Span: 3.35 m (10.99 ft). Apogee: 150 km (90 mi). 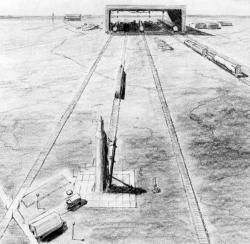 The Global Rocket 1 (GR-1) requirement of 1961 called for a system to place a large nuclear warhead equipped with a deorbit rocket stage into a low earth orbit of 150 km altitude. The warhead could approach the United States from any direction, below missile tracking radar, so little warning was available. Not only could such a missile hit any point on earth, but the enemy would also be uncertain when it would be deorbited onto target. The disadvantages were greater complexity, lower accuracy, and the need to use a lighter warhead in comparison to an ICBM. Furthermore American development and deployment of infrared early-warning satellites in the 1970's invalidated the warning advantage. Chelomei proposed his UR-200 for the requirement, while Yangel offered the R-36, and Korolev the 8K713. An official decree authorized development to begin in April 1962. Yangel completed his draft project in December 1962 and began flight tests of the basic R-36 ICBM in 1963. Development problems with Korolev's rocket resulted in continual delays, resulting in its cancellation in 1964. Following Khrushchev's ouster from power in October 1964, Chelomei's UR-200 project was reviewed and cancelled as well. This left Yangel's R-36 for the mission. Flight trials of the system began on 16 October 1965 from silos at LC-160 and LC-162 at Baikonur. Since orbiting of nuclear weapons was a violation of international treaty, the Soviet Union conducted all tests on a 'fractional orbit' basis - i.e. the test warheads were deorbited after less than one orbit of the earth. The launches were however logged and tracked as satellites by international treaty. There were four launches in 1966 and 10 in 1967. The United States only publicly noted the probable FOBS mission of the tests on 3 November 1967. The system was formally accepted for military service on 19 November 1968. A military regiment to operate the missiles was formed in August 1971. 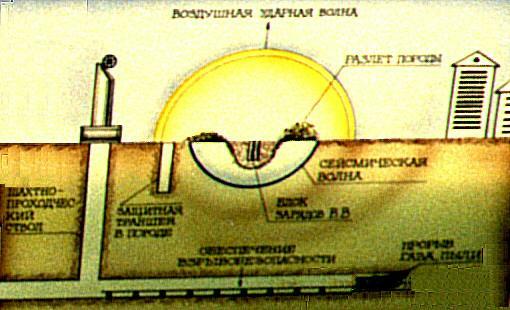 The system was in service at 18 silos at Baikonur from 25 August 1969 to January 1983. Under SALT-2 12 of these silos were demolished, the remaining six being retained for launch of R-36M's converted to orbital launch vehicle use. In common with other R-36 versions, the missile had a 7.5 year guaranteed fuelled storage life and a five minute reaction time. The 8F021 orbiting warhead had the Russian acronym OGCh. It consisted of an SU equipment unit which oriented the spacecraft in orbit and autonomously determined when to make the braking maneuver to bring the re-entry vehicle down from orbit. The SU included an inertial navigation system and a radar altimeter which measured the altitude of the orbit and thereby determined when to make the braking maneuver. 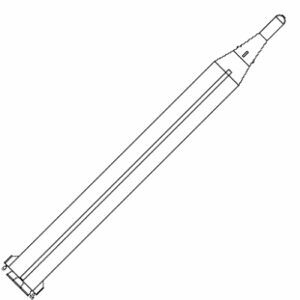 A solid fuel cartridge then spun up the turbine assembly of the liquid propellant (N2O4/UDMH) braking engine. Orientation was by 4 + 4 thrusters using turbine exhaust gases. LEO Payload: 1,700 kg (3,700 lb) to a 150 km orbit. Standard warhead: 1,700 kg (3,700 lb). Maximum range: 40,000 km (24,000 mi). Number Standard Warheads: 1. Standard RV: 8F021. Warhead yield: 5,000 KT. CEP: 1.10 km (0.60 mi). Boost Propulsion: Storable liquid rocket, N2O4/UDMH. Cruise Thrust: 940.400 kN (211,410 lbf). Cruise Thrust: 95,900 kgf. Cruise engine: RD-252. Initial Operational Capability: 1969. Stage 1. 1 x R-36-0-1. Gross Mass: 125,000 kg (275,000 lb). Empty Mass: 8,500 kg (18,700 lb). Thrust (vac): 2,640.000 kN (593,490 lbf). Isp: 301 sec. Burn time: 120 sec. Isp(sl): 269 sec. Diameter: 3.00 m (9.80 ft). Span: 3.00 m (9.80 ft). Length: 18.90 m (62.00 ft). Propellants: N2O4/UDMH. No Engines: 1. Engine: RD-251. Status: In Production. Stage 2. 1 x R-36-0-2. Gross Mass: 48,000 kg (105,000 lb). Empty Mass: 5,000 kg (11,000 lb). Thrust (vac): 955.991 kN (214,915 lbf). Isp: 317 sec. Burn time: 160 sec. Diameter: 3.00 m (9.80 ft). Span: 3.00 m (9.80 ft). Length: 9.40 m (30.80 ft). Propellants: N2O4/UDMH. No Engines: 1. Engine: RD-252. Status: In Production. Family: orbital. Country: Ukraine. Engines: RD-251, RD-252, RD-854. Spacecraft: OGCh. 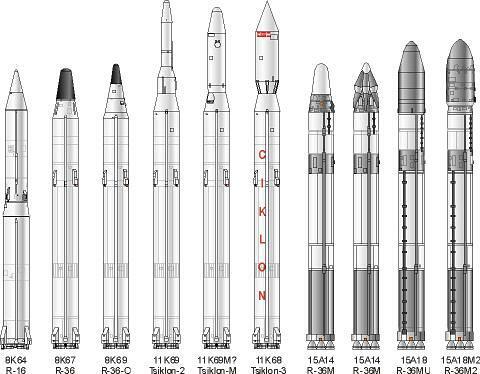 Launch Sites: Baikonur, Baikonur LC67/21, Baikonur LC67/22, Baikonur LC162/36, Baikonur LC161/35, Baikonur LC191/66. Stages: R-36-0-1, R-36-0-2. Agency: Yuzhnoye. 1965 March 5 - . Launch Site: Baikonur. Launch Complex: Baikonur LC67/21. LV Family: R-36. Launch Vehicle: R-36O 8K69. FAILURE: Second stage propellant leak led to a fire in the silo.. Failed Stage: 2. First attempted launch of Fractional Orbital Bombardment System booster. - . Mass: 1,700 kg (3,700 lb). Nation: Russia. Agency: RVSN. Spacecraft: OGCh. COSPAR: F19650305. A fire broke out during fuelling and the rocket exploded, seriously damaging the launch pad at Area 67..
1965 December 16 - . Launch Site: Baikonur. Launch Complex: Baikonur LC67/21. LV Family: R-36. Launch Vehicle: R-36O 8K69. OGCh No. 01L - . Mass: 1,700 kg (3,700 lb). Nation: Russia. Agency: RVSN. Spacecraft: OGCh. 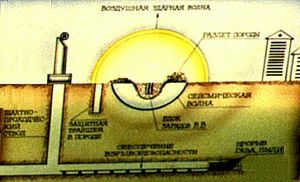 COSPAR: U651216A. Apogee: 200 km (120 mi). First suborbital test of the FOBS system. Impacted within specification CEP in target zone..
1966 February 5 - . Launch Site: Baikonur. Launch Complex: Baikonur LC67/21. LV Family: R-36. Launch Vehicle: R-36O 8K69. OGCh No. 02L - . Mass: 1,700 kg (3,700 lb). Nation: Russia. Agency: RVSN. Spacecraft: OGCh. COSPAR: U660205A. Apogee: 200 km (120 mi). Second suborbital test of the FOBS system..
1966 March 17 - . 22:00 GMT - . Launch Site: Baikonur. Launch Complex: Baikonur LC67/21. LV Family: R-36. Launch Vehicle: R-36O 8K69. OGCh No. 03L - . Mass: 1,700 kg (3,700 lb). Nation: Russia. Agency: RVSN. Spacecraft: OGCh. COSPAR: U660316A. Apogee: 0 km (0 mi). Last of three suborbital flight tests of the FOBS system. 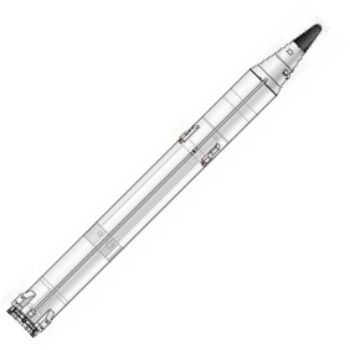 The second stage of the booster placed the third stage and dummy warhead on a depressed trajectory with a range of 8500 km but an altitude of only 220 km (versus 800 to 1200 km for an optimum ballistic trajectory). The third stage than executed a 180 degree turn and its engines were fired to further brake the warhead to an impact on the Kamchatka peninsula. The second stage meanwhile continued on to reentry over the Pacific Ocean. 1966 May 20 - . 19:00 GMT - . Launch Site: Baikonur. Launch Complex: Baikonur LC67/22. LV Family: R-36. Launch Vehicle: R-36O 8K69. OGCh No. 04L - . Mass: 1,700 kg (3,700 lb). Nation: Russia. Agency: RVSN. Spacecraft: OGCh. COSPAR: U660519A. Possible suborbital test of FOBS booster or failed FOBS test. Not mentioned as FOBS-related in contemporary CIA assessments..
1966 September 17 - . 22:35 GMT - . Launch Site: Baikonur. Launch Complex: Baikonur LC162/36. LV Family: R-36. Launch Vehicle: R-36O 8K69. OGCh - . Mass: 1,700 kg (3,700 lb). Nation: Russia. Agency: RVSN. Class: Military. Type: Orbital bombing system. Spacecraft: OGCh. Decay Date: 1966-11-11 . USAF Sat Cat: 2437 . COSPAR: 1966-088A. Apogee: 792 km (492 mi). Perigee: 138 km (85 mi). Inclination: 49.60 deg. Period: 93.90 min. First attempted orbital Fractional Orbital Bombardment System test. The second stage of the booster placed the third stage and dummy warhead into a 214 km x 523 km parking orbit. altitude. The third stage was evidently wrongly oriented, and instead of braking the warhead into an impact at Kapustin Yar, boosted it into a higher 280 km x 1,010 km orbit. The dummy warhead seperated but was commanded to self destruct, resulting in over 100 catalogued orbiting objects. 1966 November 2 - . 00:50 GMT - . Launch Site: Baikonur. Launch Complex: Baikonur LC162/36. LV Family: R-36. Launch Vehicle: R-36O 8K69. OGCh - . Mass: 1,700 kg (3,700 lb). Nation: Russia. Agency: RVSN. Class: Military. Type: Orbital bombing system. Spacecraft: OGCh. Decay Date: 1976-04-26 . USAF Sat Cat: 2931 . 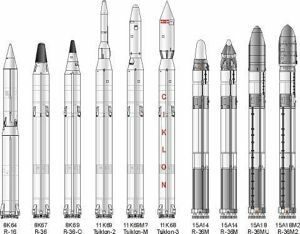 COSPAR: 1966-101AS. Apogee: 767 km (476 mi). Perigee: 504 km (313 mi). Inclination: 49.10 deg. Period: 97.43 min. Second attempted orbital Fractional Orbital Bombardment System test. failure - self destruct charge was detonated, resulting in 50 catalogued orbiting objects. No impact of the dummy warhead in the Kapustin Yar impact zone..
1967 January 25 - . 13:55 GMT - . Launch Site: Baikonur. Launch Complex: Baikonur LC162/36. LV Family: R-36. Launch Vehicle: R-36O 8K69. Cosmos 139 - . Mass: 1,700 kg (3,700 lb). Nation: Russia. Agency: RVSN. Class: Military. Type: Orbital bombing system. Spacecraft: OGCh. Decay Date: 1967-01-25 . USAF Sat Cat: 2656 . COSPAR: 1967-005A. Apogee: 210 km (130 mi). Perigee: 144 km (89 mi). Inclination: 49.70 deg. Period: 88.00 min. Third orbital Fractional Orbital Bombardment System test. First apparently successful test. 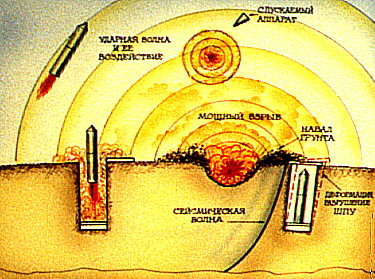 The warhead was braked to an impact in the Kapustin Yar range..
1967 March 22 - . 14:05 GMT - . Launch Site: Baikonur. Launch Complex: Baikonur LC161/35. LV Family: R-36. Launch Vehicle: R-36O 8K69. FAILURE: Failure. OGCh - . Nation: Russia. Agency: RVSN. 1967 May 17 - . 16:05 GMT - . Launch Site: Baikonur. Launch Complex: Baikonur LC161/35. LV Family: R-36. Launch Vehicle: R-36O 8K69. Cosmos 160 - . Mass: 1,700 kg (3,700 lb). Nation: Russia. Agency: RVSN. Class: Military. Type: Orbital bombing system. Spacecraft: OGCh. Decay Date: 1967-05-18 . USAF Sat Cat: 2806 . COSPAR: 1967-047A. Apogee: 177 km (109 mi). Perigee: 137 km (85 mi). Inclination: 49.70 deg. Period: 87.60 min. Fractional Orbital Bombardment system test..
1967 July 17 - . 16:45 GMT - . Launch Site: Baikonur. Launch Complex: Baikonur LC162/36. LV Family: R-36. Launch Vehicle: R-36O 8K69. Cosmos 169 - . Mass: 1,700 kg (3,700 lb). Nation: Russia. Agency: RVSN. Class: Military. Type: Orbital bombing system. Spacecraft: OGCh. Decay Date: 1967-07-17 . USAF Sat Cat: 2878 . COSPAR: 1967-069A. Apogee: 200 km (120 mi). Perigee: 135 km (83 mi). Inclination: 49.70 deg. Period: 87.80 min. Fractional Orbital Bombardment system test..
1967 July 31 - . 16:45 GMT - . Launch Site: Baikonur. Launch Complex: Baikonur LC161/35. LV Family: R-36. Launch Vehicle: R-36O 8K69. Cosmos 170 - . Mass: 1,700 kg (3,700 lb). Nation: Russia. Agency: RVSN. Class: Military. Type: Orbital bombing system. Spacecraft: OGCh. Decay Date: 1967-07-31 . USAF Sat Cat: 2902 . COSPAR: 1967-074A. Apogee: 199 km (123 mi). Perigee: 141 km (87 mi). Inclination: 49.60 deg. Period: 87.90 min. Fractional Orbital Bombardment system test..
1967 August 8 - . 16:05 GMT - . Launch Site: Baikonur. Launch Complex: Baikonur LC162/36. LV Family: R-36. Launch Vehicle: R-36O 8K69. Cosmos 171 - . Mass: 1,700 kg (3,700 lb). Nation: Russia. Agency: RVSN. Class: Military. Type: Orbital bombing system. Spacecraft: OGCh. Decay Date: 1967-08-08 . USAF Sat Cat: 2911 . COSPAR: 1967-077A. Apogee: 177 km (109 mi). Perigee: 138 km (85 mi). Inclination: 49.60 deg. Period: 87.60 min. Fractional Orbital Bombardment system test..
1967 September 19 - . 14:45 GMT - . Launch Site: Baikonur. Launch Complex: Baikonur LC161/35. LV Family: R-36. Launch Vehicle: R-36O 8K69. Cosmos 178 - . Mass: 1,700 kg (3,700 lb). Nation: Russia. Agency: RVSN. Class: Military. Type: Orbital bombing system. Spacecraft: OGCh. Decay Date: 1967-09-19 . USAF Sat Cat: 2951 . COSPAR: 1967-089A. Apogee: 258 km (160 mi). Perigee: 138 km (85 mi). Inclination: 49.70 deg. Period: 88.40 min. Fractional Orbital Bombardment system test..
1967 September 22 - . 14:05 GMT - . Launch Site: Baikonur. Launch Complex: Baikonur LC162/36. LV Family: R-36. Launch Vehicle: R-36O 8K69. Cosmos 179 - . Mass: 1,700 kg (3,700 lb). Nation: Russia. Agency: RVSN. Class: Military. Type: Orbital bombing system. Spacecraft: OGCh. Decay Date: 1967-09-22 . USAF Sat Cat: 2962 . COSPAR: 1967-091A. Apogee: 207 km (128 mi). Perigee: 139 km (86 mi). Inclination: 49.60 deg. Period: 87.90 min. Fractional Orbital Bombardment system test..
1967 October 18 - . 13:30 GMT - . Launch Site: Baikonur. Launch Complex: Baikonur LC161/35. LV Family: R-36. Launch Vehicle: R-36O 8K69. Cosmos 183 - . Mass: 1,700 kg (3,700 lb). Nation: Russia. Agency: RVSN. Class: Military. Type: Orbital bombing system. Spacecraft: OGCh. Decay Date: 1967-10-18 . USAF Sat Cat: 3001 . COSPAR: 1967-099A. Apogee: 306 km (190 mi). Perigee: 140 km (80 mi). Inclination: 49.60 deg. Period: 89.00 min. Fractional Orbital Bombardment system test..
1967 October 28 - . 13:15 GMT - . Launch Site: Baikonur. Launch Complex: Baikonur LC162/36. LV Family: R-36. Launch Vehicle: R-36O 8K69. Cosmos 187 - . Mass: 1,700 kg (3,700 lb). Nation: Russia. Agency: RVSN. Class: Military. Type: Orbital bombing system. Spacecraft: OGCh. Decay Date: 1967-10-28 . USAF Sat Cat: 3016 . COSPAR: 1967-106A. Apogee: 301 km (187 mi). Perigee: 143 km (88 mi). Inclination: 49.60 deg. Period: 88.90 min. Fractional Orbital Bombardment System test..
1968 April 25 - . 00:43 GMT - . Launch Site: Baikonur. Launch Complex: Baikonur LC162/36. LV Family: R-36. Launch Vehicle: R-36O 8K69. Cosmos 218 - . Mass: 1,700 kg (3,700 lb). Nation: Russia. Agency: RVSN. Class: Military. Type: Orbital bombing system. Spacecraft: OGCh. Decay Date: 1968-04-25 . USAF Sat Cat: 3217 . COSPAR: 1968-037A. Apogee: 162 km (100 mi). Perigee: 123 km (76 mi). Inclination: 49.60 deg. Period: 87.30 min. Fractional Orbital Bombardment System test..
1968 May 21 - . Launch Site: Baikonur. Launch Complex: Baikonur LC162/36. LV Family: R-36. Launch Vehicle: R-36O 8K69. OGCh - . Mass: 1,700 kg (3,700 lb). Nation: Russia. Agency: RVSN. Class: Military. Type: Orbital bombing system. Spacecraft: OGCh. COSPAR: 1968-U01xx. Probable suborbital test of Fractional Orbital Bombardment System..
1968 May 28 - . Launch Site: Baikonur. Launch Complex: Baikonur LC161/35. LV Family: R-36. Launch Vehicle: R-36O 8K69. OGCh - . Mass: 1,700 kg (3,700 lb). Nation: Russia. Agency: RVSN. Class: Military. Type: Orbital bombing system. Spacecraft: OGCh. COSPAR: 1968-U02xx. Probable suborbital test of Fractional Orbital Bombardment System..
1968 October 2 - . 13:35 GMT - . Launch Site: Baikonur. Launch Complex: Baikonur LC161/35. LV Family: R-36. Launch Vehicle: R-36O 8K69. Cosmos 244 - . Mass: 1,700 kg (3,700 lb). Nation: Russia. Agency: RVSN. Class: Military. Type: Orbital bombing system. Spacecraft: OGCh. Decay Date: 1968-10-02 . USAF Sat Cat: 3449 . COSPAR: 1968-082A. Apogee: 158 km (98 mi). Perigee: 140 km (80 mi). Inclination: 49.60 deg. Period: 87.40 min. Fractional Orbital Bombardment System test..
1968 November 19 - . LV Family: R-36. Launch Vehicle: R-36O 8K69. R-36-O rocket accepted into military service. - . Nation: Russia. Decree 'On adoption of the R-36-O into armaments' was issued..
1969 September 15 - . 16:05 GMT - . Launch Site: Baikonur. Launch Complex: Baikonur LC191/66. LV Family: R-36. Launch Vehicle: R-36O 8K69. Cosmos 298 - . Mass: 1,700 kg (3,700 lb). Nation: Russia. Agency: RVSN. Class: Military. Type: Orbital bombing system. Spacecraft: OGCh. Decay Date: 1969-09-15 . USAF Sat Cat: 4092 . COSPAR: 1969-077A. Apogee: 162 km (100 mi). Perigee: 127 km (78 mi). Inclination: 49.60 deg. Period: 87.30 min. Fractional Orbital Bombardment System test..
1970 July 28 - . 22:00 GMT - . Launch Site: Baikonur. Launch Complex: Baikonur LC191/66. LV Family: R-36. Launch Vehicle: R-36O 8K69. Cosmos 354 - . Mass: 1,700 kg (3,700 lb). Nation: Russia. Agency: RVSN. Class: Military. Type: Orbital bombing system. Spacecraft: OGCh. Decay Date: 1970-07-28 . USAF Sat Cat: 4481 . COSPAR: 1970-056A. Apogee: 165 km (102 mi). Perigee: 137 km (85 mi). Inclination: 49.60 deg. Period: 87.50 min. Fractional Orbital Bombardment System test..